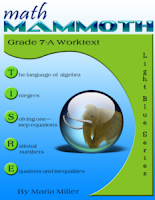 Check out a new review of Math Mammoth pre-algebra program, by David Chandler. 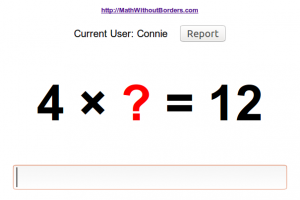 In case you didn't know, on his website Math Without Borders, Chandler offers "home study companion" products for homeschoolers that match certain high school math textbooks. This tool also practices the tables both forwards and backwards at the same time -- which is exactly the approach I've taken in my books and in my videos for the multiplication tables. Practicing them both ways is so great, because it allows the students to master division facts "in disguise" at the same time. What does it mean? For example, students not only learn the answers to 2 x 6, 3 x 6, 4 x 6, 5 x 6, etc. but also practice the missing factor problems: ___ x 6 = 12, ___ x 6 = 30, ___ x 6 = 72, ___ x 6 = 42, etc. Get 25% off of all Math Mammoth & Make It Real Learning products sold at Kagi (downloads and CDs). The offer is valid till June 1, 2016. Use coupon code MAYSALE at Kagi store, on the 2nd page of the order process. You will find links to Kagi's order pages at MathMammoth.com on the various product pages. Order Light Blue seriesOrder the International versionOrder the South African versionOrder Blue seriesOrder Spanish versions of the Blue series booksOrder Golden and Green SeriesOrder Make It Real Learning activity workbooksOrder Bundles (CDs or downloads)Order Review workbooks — great for summer math! It is time for a Math Mammoth giveaway! There will be 12 prizes! TWO (2) winners will get Math Mammoth All Inclusive bundle - either a download or a CDTWO (2) winners will get Math Mammoth Light Blue Series bundle - either a download or a CDTWO (2) winners will get Math Mammoth Blue Series bundle - either a download or a CDSIX (6) winners will get one grade level of Math Mammoth Light Blue series - download - the grade level is chosen by each winner. The winners will be chosen by a random number generator. How to take part? Visit the page www.mathmammoth.com/giveaway, and enter your email address in the Rafflecopter giveaway gadget you see on the page. People from outside the USA are also welcome to take part! We can ship CDs worldwide, or you can receive the Math Mammoth materials as a download. There are no answers given, because there are SO many answers! 1. The shape in the upper left corner doesn't belong, because all the others have all of their sides the same length, whereas this one doesn't. 2. The shape in the upper right corner doesn't belong, because it is gray, whereas the others are white. 3. The shape in the lower left corner doesn't belong, because it is standing on its vertex, whereas the others are not. 4. The shape in the lower right corner doesn't belong, because it has five sides, whereas the others have four. "Maria, do you have a product that would good for 3rd grade summer review to make sure a child is ready for the next year and that would introduce us both (me and my son) to your program since we will be switching from another program to MM for the fist time in this fall? Maybe a condensed general review?"